We’re extremely proud to be featured in the Sustainability Influencers Power List tips selection on how to make a green company by the recently recognised Green Seal TM Green Office Partner- OWDT. This Houston based web design and marketing agency has been accorded the prestigious green badge for it’s sustainability efforts. And to mark the occasion the company had drawn up an impressive power list of sustainability influencers from all around the world to give pro tips on how to build a green company and a green office. UrbanMeisters founder Mirela Orlovic is a part of this influential list and has been featured with her pro tips and we couldn’t be more proud. Mirela is a social entrepreneur who’s been at the forefront of facilitating conscious consumption for fellow urbans, pushing for more transparency from brands and fighting urban pollution. This collaboration with OWDT has been a fabulous experience and a validation of her vision and work towards making sustainability mainstream. So here’s the full feature with very interesting tips from experts on how to build a green company. 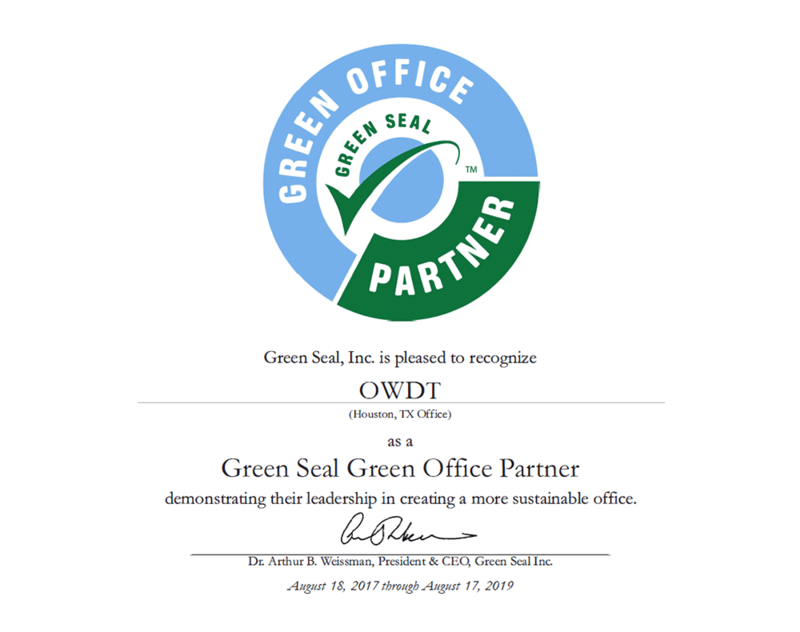 We are proud to announce that OWDT has officially been recognized as a Green Seal TM Green Office Partner. We are confronted everyday with images of smog over cities, glaciers melting, dead zones in the Gulf of Mexico, overflowing landfills, garbage islands in the Pacific. As a country we all share some of the blame and yes there are systemic changes that need to be made at the highest levels of government to solve these issues on a macro scale, and we put our faith in these people and trust they will make the best decisions to address these environmental concerns. This leads to the next question, what can we do as individuals to affect sustainability? We trust in officials to make the right decisions to protect the environment, but what do we all do on a day-to-day basis to contribute to the issues affecting our environment every day. This question is what lead our company to start on our journey to becoming a green company. From this point forward we were committed to finding a reputable non-profit that could guide our company towards becoming sustainable. On a micro-scale, we can all do something to affect positive change in our environment and help preserve nature. Americans are less than 5% of the world population yet consume more than 25% of the world resources. At OWDT, we already were implementing green practices for the office, but we wanted to make it official by incorporating them into our company-wide policy and incentivizing employees who participate. Employees are already taking advantage of the new green policies like, Tyler Stavola and Justin Nowroozi who carpool (daily) to the office which reduces our contribution to transportation emissions. Andrew Mani spearheads our recycling, in where he drops off our recyclables to Westpark Consumer Recycling Center due to our buildings waste management company not offering to recycle. We have remote employees like Dennis Ghyst who work from their ‘virtual offices’, which reduces our emissions from transportation. There are millions of blogs that talk about ways to make your company green, but we wanted to go with a credible non-profit that could really guide us to becoming a sustainable company. That is why we decided to partner with Green Seal to codify what we were already doing, and to receive direction as well as third-party verification. Under the direction of Fernanda Cabrera being appointed as our fearless “Green Leader,” we have made great strides towards the goal of sustainability by meeting Green Seals partnership requirements. Seth Leitman, better known as the ‘The Green Living Guy®‘ lends his support, “Having any company become a Green Seal Partner is always a great thing. So when OWDT web design company (first in this type of genre) became a member I said two thumbs up!” Our next action was to create our own unique commitment to sustainable business practices with the direction of Earth Forward Growth a sustainability firm that specializes in small business solutions. We believe that good environmental stewardship is a personal and corporate responsibility and that we can all contribute to tackling the global challenge that climate change presents. OWDT is committed to incorporating environmentally positive policies in our business model, to ensure day-to-day operations minimize our environmental footprint, and reflect our core values. OWDT supports the generation of clean, renewable energy in Texas and will purchase 100% of our electricity needs from recognized renewable energy providers in the state. We commit to purchasing all equipment and materials locally, to support the regional economy and mitigate transportation emissions. We believe responsible energy use benefits us all, so we will adopt smart technology to reduce our daily energy demand. OWDT supports the work and recommendations of the Carbon Disclosure Project (CDP) and we will voluntarily disclose our energy consumption data annually, which can be used by the scientific community for research, analysis and long-term energy planning scenarios. We are committed to achieving our target of an 80% reduction in our carbon footprint by 2050. Reduce, Reuse, Recycle: OWDT policy is to be a zero-waste green company and therefore we will recycle and repurpose all our business materials to ensure we avoid contributing to the waste stream. A safe and healthy work environment for all our employees, customers and suppliers is of paramount importance to us all. We will ensure indoor air quality use by using certified low-emitting products with the Green Seal® and office furniture with the Green Guard® or those that are made from certified renewable resources. At OWDT we pride ourselves on our environmental commitment and look forward to helping our customers do the same. Green Seal TM, a nonprofit organization founded in 1989, is the nation’s premier eco-label, symbolizing transparency, integrity, and environmental leadership. It is most widely-known for its flagship Certification Program, which develops life-cycle-based environmental standards and certifies products and services that meet these standards. Green Seal standards cover 450 categories – from janitorial supplies, paints, and windows to restaurants and hotels – and are specified by countless states, agencies, schools, and institutions. The Green Office Partnership is one of its many other initiatives and was developed to help companies green their office operations and receive third-party recognition for their improvements. What is the Green Office Partnership Program? For more information on the Green Office Partnership, visit GreenOfficePartner.org or call 202-872-6400, and for general Green Seal information visit greenseal.org. 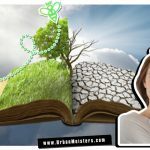 How to help your company go green? The U.S. small business administration (SBA), US environmental protection agency (EPA) and ENERGYSTAR(r) are a great starting point when looking for information on green ideas for small and medium-sized companies. Becoming a green company starts with small steps, and once you start on the journey of sustainability all you need to do is rinse and repeat. Here are a few suggestions you can use to start the process of becoming a green company. Encourage employees to pick one day a week where they will only eat vegetarian food. See Meatless Monday for more ideas. Promote a Community Supported Agriculture (CSA) program at work. By joining a local CSA, employees can receive the freshest vegetables, fruits, meats, and eggs straight from the farm. See Local Harvest for more information. Host a “Farmers Market Experience” to promote awareness of sustainable food. Print out a list of local farmers’ markets around your area and provide information highlighting why shopping local is good for the environment. Bring in actual fruits and veggies from a local farmers market for employees to try and take home to their families. See Environmental Working Group’s top fruit and vegetables to buy organic for more information. Give employees a small seedling they can grow at home. Plant a small garden on-site if space is available. No company is too small to go green! In fact, it might be easier to propose and implement official policies or programs when you have more direct access to leadership. Start small. Implementing big changes among so many people might be difficult for some to adapt to, especially for the first couple of months. We started out by placing signs above our recycle bins and garbage cans in the kitchen that tell us where we should dispose of some of our most popular office snacks. Eventually, you can move up to implementing bigger changes. 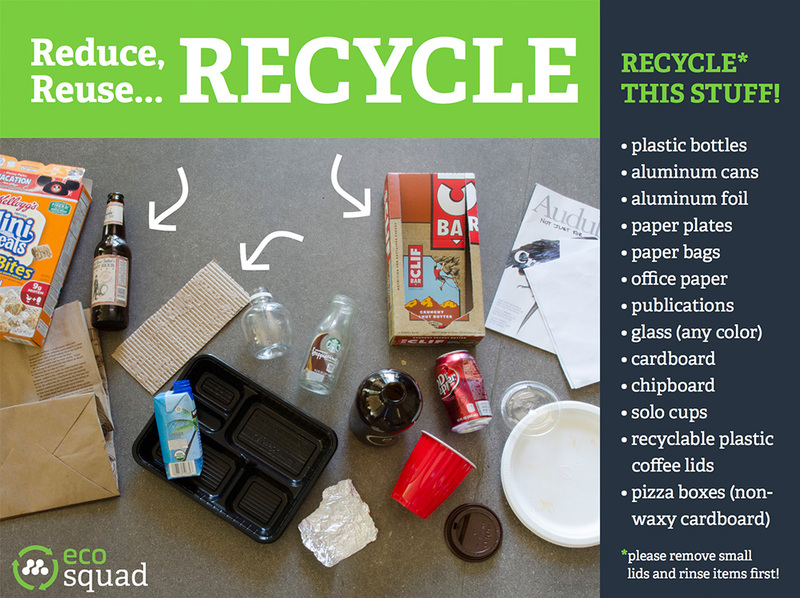 Find a way to recycle your recyclable goods even if it is not offered in your location. Recycling is a stable of sustainability across the world over the last few years. People want corporations that do not focus solely on short-term profit maximization, recycling helps. People want these businesses to be responsible and have the policy to keep waste in check. Cutting down on waste is another way of making your company green. Use biodegradable packaging along with recyclable materials. This simple change reduces waste dramatically. Your company may be able to recycle, paper products too. So instead of making physical copies of everything, try to transition to working digitally as much as you can. Writing out schedules, memos and copy via digital programs instead of on paper will lead to less waste. Keeping files stored digitally reduces waste and improves the organization. To take this thinking a step further it is recommended to turn off all the computer equipment at night. A great way to implement keep an eye on this is to install energy-management software that can track the impact. Try turning off computers, printers, lights, and equipment at the end of the workday or when not in use, you can immediately make a positive impact on your company’s bottom line. Computer monitors should be turned off when not in use. Other smart hacks like unplugging mobile phone chargers after use helps because they use energy even when they are not charging mobile devices. Even adjusting the office temperature by a degree here and there saves a lot of money, and most people will not feel the difference of a few degrees. It is this type of involvement that makes a difference when you add it all up in the end. Indoor Pollution: One of the biggest stress triggers at work is low productivity and believe it or not indoor pollution has a lot to do with it. The air in your office is not the healthy oasis you may think it is – while we spent 90% of our time indoors. In general indoor pollution is 2-5 times higher than outdoors. The sources of office pollution are super complex which makes it difficult to manage them: air-tight offices with poor ventilation, emissions from office equipment and machines, building materials, insulation and paint, cleaning products, office furnishing, indoor temperature regulation … and finally even office stationary like whiteners, markers, highlighters, air freshers contain volatile organic compounds (VOCs) which accelerate office pollution. Make the office air more healthy and clean. Make it a green office– literally & metaphorically by putting up plants in your office that only beautify it but also clean the air. Research – most prominent being the NASA Clean Air Study – has found that some plants help fight indoor air pollution more than others. We have developed a comprehensive indoor plant guide for offices with partners ProFlowers, enlisting 15 best plants for combating office pollution. These have been organized by categories like best for removing pollutants, low maintenance, and best for low light so each one of you can choose the appropriate solution depending on your office. Another very helpful thing is the green product- AIRY plant pot which enables plants to clean air more effectively- and it doesn’t run on energy or batteries. Limit the use of whiteners, markers, highlighters, air freshers as far as possible. These contain volatile organic compounds (VOCs) which accelerate indoor pollution. VOCs are a large group of chemicals that easily evaporate at room temperature. They can have short and long-term adverse effects on your health. So in your green office go for dry correction tape instead of liquid correction fluid. Use water-based and scentless markers. If you are a start-up and about to furnish your office don’t use carpeting. The American Lung Associationsays new carpet – as well as the adhesives and padding used during installation – can be a source of VOC emissions and act as a “sponge” for chemical and biological pollutants. 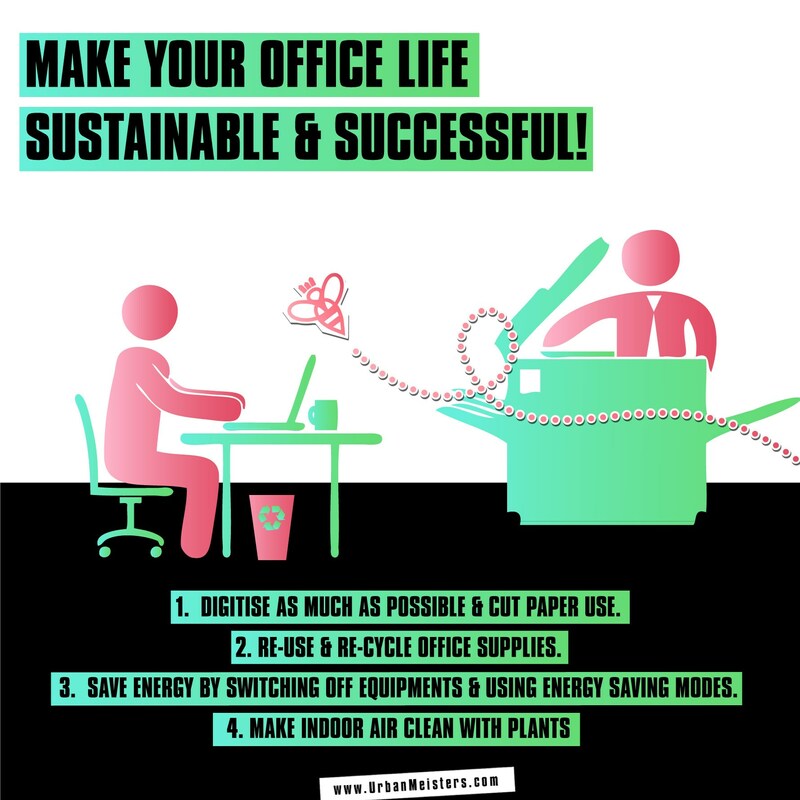 These four tips will get you started not he right track to build a sustainable work space and read the full Green Office Guide by Mirela here.